THE men of Carrick were aye "bonnie fechters" and were to be found in the forefront when Scottish armies were in the field of battle. They fought for their freedom at Bannockburn and their faith at Bothwell Brig; they brought home their dead from Flodden and left them among the poppies in Flanders; they waded through blood at Pinkie and mud at Paschendale and Carrick can always be proud of its fighting men. On the plains of Stirling Bruce proudly spoke of his "ain men from Carrick" guarding him and helping to overthrow the power of Edward at Bannockburn and Sir Walter Scott has him say, "I, with my Carrick spearmen charge" and "Carrick, press on". It was a Carrick man, Sir Hew Kennedy of Ardstinchar, who commanded the Scottish army which fought on the side of Joan of Arc and raised the siege of Orleans in the French war of liberation against the English. At the Battle of Beauge on 22nd March, 1421, he so distinguished himself by his valour that he was granted by the Dauphin the right to wear the Royal livery of France. In 1513 David, Third Lord Kennedy, led the Carrick men at Flodden and died with his King, James VI, as did many other men from the district, and Lord Kennedy's body was brought home to Maybole and buried at the old Collegium. At Langside they fought both for and against their Mary, Queen of Scots, and some went into exile in England with her. At the disaster at Pinkie in 1547 many Carrick men died, among them twelve Lairds or their eldest sons and there was much mourning in the old Kingdom. The Maybole Covenanters mustered in a field at Whitefaulds (where the house known as "Muster Lea" now stands) and marched to fight for their faith at Bothwell Brig in 1679. Among the 1,200 prisoners taken after the Covenanters fled the field were 257 who, after five months imprisonment in Greyfriars Churchyard, refused to renounce their belief and were shipped as slaves to America but were drowned when their ship, the "Crown", foundered in a storm off the Orkneys in December, 1679. Among these 257 were 21 Carrick men and of these six were Minniebolers. Their names are inscribed on the Covenanters' Memorial on the Cross Roads and they were Mungo Eccles, Thomas Horne, Robert McGarron, John McHarrie, John McWhirter and William Rodger. At the time of the Bishop's Wars about the middle of the 17th century the Earl of Cassillis commanded a troop of Carrick men who fought for their religion and many Maybole men served under his command. At the Battle of Alford in June, 1645, a Captain John Conic of Maybole was killed, and his testament, dated April 1645, states he had "been called out to fight for his Kirk and his Kingdom". When the Carrick men were not united against common foes outside their own district they turned joyously on each other and for generations the old High Street in Maybole was often the scene of strife when the Bargany men and the Cassillis adherents cleared the causeway of the sober burgesses and their wives, who waited patiently until the tumult died down and they could come out from behind their barred doors and bandage up the broken heads. This internecine and intermittent warfare lasted until young Bargany met his death at the skirmish at Ladycross which virtually brought an end to the famous Carrick Feud. On 21st December, 1760, there was born in Maybole a man who must have been one of the longest serving soldiers in army history. His epitaph states that Lt. Col. Thomas Aird was born in Maybole, served 56 years in the service of his country, and died in Sunderland on 1st November, 1839, aged 79 years. During his long army service he was 28 years in the Royal Scots Greys and commanded a corps throughout the Peninsular campaign and fought at Waterloo. It was not until the end of the eighteenth century, however, that the Maybole men were banded together as one fighting unit. In 1797 the Loyal Carrick Volunteers, consisting of 114 men, were formed in the town to give their support, if needed, in beating off the threatened invasion by Napoleon. They would have made better wartime soldiers than back line Home Guards, however, and the only foe they faced were their spouses on the morning after they were disbanded for "drunk and riotous behaviour" on parade in the Town Green the previous evening. This does not reflect on their bravery, however, as any married man will agree it would be easier to meet a Froggie (even if only armed with a spade) than an enraged and affronted wife after she had spent a night nursing her wrath to keep it warm. Later most of the townsmen with a liking for soldiering enlisted in the local County Regiment, the 21st Foot (later the Royal Scots Fusiliers) and saw service in many lands with this famous regiment. In 1793 the 12th Earl of Cassillis formed, among the local farmers and townsmen, a troop of yeomanry known as "The Earl of Carrick's Own Yeomanry" in honour of their royal feudal superior, the Earl of Carrick and heir to the Crown. This gave rise to the Ayrshire Yeomanry who saw service with their horses in many campaigns until they were finally dismounted during the first World War and attached to the County Regiment as foot soldiers. In the second World War they became a mechanised unit and, although officially now disbanded some loyal and proud troopers still meet for summer camps and exercises and will be ready once again if ever needed by their country. The Minniebolers, however, were not so clannish as only to enlist in their local county regiments and many saw service with the Argylls, the Black Watch and other Scottish units, and Sergeant McAdie, who lived to a ripe old age, is remembered by many townspeople proudly parading on occasion with his breastful of medals which showed he had been on the Kabul to Khandahar march, and in many other campaigns. It is interesting that the famous Covenanting Regiment, The Cameronians, or 26th Foot Regiment, had great connections with the old town and the first man to enlist, when it was formed at Douglas in 1689, was Richard Slaven who lived at Kildoon, just a mile out of the town. In 1803 when the Cameronians were on route to take up garrison duty in Ireland they camped in the old Sheep Park from the 2nd to the 6th December and the regimental band paraded for the entertainment of the townsfolk. No doubt the sound of "The Black Bear" in the old High Street would stir many of the local youths to keep time to the quick step of this famous Rifle Regiment which bore the black button in memory of the death of Richard Cameron. It must have been a great sight when the tents of the regiment were erected at the Sheep Park, armed sentries were posted and the elders gathered their companies together for communion, which was one of the prized traditions of the regiment. The townspeople so appreciated the visit of the regiment that they raised a subscription "for the purpose of treating the Cameronians on their march through Maybole to Ireland with a glass of spirits and a bake" while the officers were dined by some of the prominent townsfolk at the Kings Arms Hotel the evening before they left. The account for the cost of entertaining the soldiers was faithfully minuted in the Council Records and reads, "61 gallons whiskie, £2 6s. 9d; loaves and bakes, £0 l0s l0d; balance of subscription given to the poor, £0 1 5s. 11 d; total £3 13s. 6d." (It will be noted that there was not an overdue demand on the "loaves and bakes"). This sum did not include the cost of entertaining the officers which seems to have been paid by their hosts who no doubt would dine and wine them well and there must have been some sore heads when the regiment marched out of the town by the Whitefaulds road to Tippersweil and on towards Girvan, with their rifles at the trail and with the quickstep peculiar to all rifle regiments. In 1859 once again there were rumours and alarms of an invasion by the "Froggies" across the English Channel and the Maybole men, as their fathers had done in 1797, decided to form a unit to assist in the defence of the country. The Volunteer movement sprang up throughout Britain at this time and General Peel, War Minister of the Government, agreed, to accept the services of such men as would equip themselves at their own expense, ask for no pay and fight when needed, and to everyone's astonishment an armed force of over one hundred thousand men was enrolled within a short time, having as their motto "Defence not Defiance". Although the danger from France passed away the Volunteer movement had come to stay and continued to the present day in various forms until in 1968 the Territorial Army was more or less disbanded. After a great deal of wrangling among the would be officers of the corps, the Minniebolers in January, 1860, subscribed £200 to equip the men and by March of that year the Maybole corps of the Ayrshire Rifle Volunteers was formed. It consisted of eighty men and the officers elected were: David Brown, Writer, Captain; William Murray, Writer, lieutenant; Thomas Austin, ensign; Dr. Girvan, surgeon; Richard Parkinson, bugler; Rev. John Thomson, minister in West Parish Church, chaplain. The officers were dressed in befrogged frock coats and the men in blue tunics and grey drill trousers with pill box caps. These leaders faithfully drilled their men until they were well able to compete with the other companies of the Ayrshire Battalion (which comprised over 1,000 men under the command of the Marquess of Ailsa who had been gazetted Lieutenant-Colonel of the Rifle Volunteers) when shooting matches, etc., were held and indeed the Maybole rifle team won many trophies on the range. By 1879 the Ayrshire Battalion was composed of fifteen companies and the war office in 1880 split them into two battalions, which were in being until 1887 when the 2nd Battalion, which had its headquarters in Ayr, became the 2nd Rifle Volunteer Battalion of the Royal Scots Fusiliers. 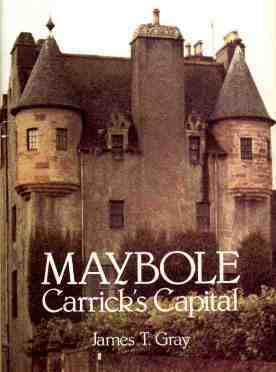 The Maybole men were formed into "C" company of the 2nd Rifle Volunteer Battalion of the R.S.F. and many of the locals drilled in the Sheep Park or at the Town Green, practised shooting in the old "Armoury" and made a bee line for "Bobby Gerrand's" in the Kildoup when dismissed from their labours. The Minniebolers never were in favour of being connected with the R.S.F. and staunchly adhered to be the old form of "Ayrshire Rifle Volunteers" when speaking about themselves. Many medals earned by these Maybole volunteers must still be in the possession of some of their descendants and the writer has the dress sword and pill box diced cap belonging to his grandfather, together with a long service medal inscribed "Ayrshire Rifle Volunteers; "C" Company 2nd V.B.R.S. Fusiliers", with Britannia crowning a soldier with a laurel wreath on one side, and "Presented to Lieut. H. B. Gray for long service; enrolled 8th March, 1860, retired 22nd May, 1891" on the other. On 25th August, 1881, the famous "Wet Review" took place when over 40,000 Volunteers from all over Britain paraded before Queen Victoria in Queens Park, Edinburgh. The 2nd Ayrshire Rifles were present, 88 strong, and many Maybole men from "C" Company made up the Ayrshire contingent. They left Maybole by train for Ayr before 5 o'clock that morning, joined up with the Ayr riflemen, then left at 5.30 a.m. by special train for Edinburgh and on arrival there they found the skies dull and overcast but all hoped the rain would keep off until after the review. Unfortunately this was not to be and long before the parade commenced the heavens opened and there was such a deluge that the streets were flooded and Hunters Bog, where the troops were to gather, became a perfect quagmire. It was decided to carry on, however, and the Queen reviewed her citizen army in a steady downpour with spectators, and riflemen alike being drenched to the skin. The volunteers, especially, were in a sad state, with the pipeclay from their belts and the dye from their uniforms running in streaks down their grey drill trousers. Notwithstanding the rain the day was a great success and the Maybole men returned to their home town around 6 a.m. the following morning, tired and bedraggled but still in high spirits and able to muster and march behind their band to the Town Hall where they fell out to return to their homes and brag for evermore that they had been present at the "Wet Review". Through time the Volunteers merged into the Territorials in 1908 which always had a good quota of Maybole men until the powers that be decreed in 1968 that the Territorial Army was no longer required. When the Boer War broke out many of the Volunteers in the town joined fighting units as they wished to see action and the Volunteers were for home defence only, as were the Home Guard of the Second World War. On their return from active service in South Africa they were feted by the townspeople and some, who had especially distinguished themselves, were made Honorary Burgesses. The now commonplace khaki uniform was introduced at this time and some of the soldiers brought back their tunics and wore them at their work and the older people in the town well remember "Khaki" Campbell who worked on a local farm and got his nickname because he wore an old Khaki tunic. At the outbreak of the First World War in August, 1914, the Minniebolers as usual were eager to get to grips with the enemy and the local Territorials mustered at the Armoury in the town and marched behind their Band to the station where everyone from babes in arms to the oldest townsman turned out to cheer them away. There were crackers placed on the lines, the band blew its loudest, the Territorials waved and cheered and the wives and sweethearts wept as the train steamed out and those left on the platform assured each other the soldiers were only off on a picnic as the war couldn't possible last and they would be home for Christmas. Little did they think that four long weary years would pass before the Maybole men would return, and during these years many more would leave to join the forces and many would never return. In 1919 those who did come back were entertained in the Town Hall, all were given medals from the townspeople with the Town Coat of Arms on one side and inscribed with their names on the other and the men who had won special distinction for their bravery were gifted gold watches. The year 1919 was a hectic year in the old town as the returning soldiery held dances on every possible occasion and everyone made merry for a time until they realised that many of the returning men had no jobs to come back to as trade had fallen away badly in both the shoe factories and in Jacks. This meant many of the men who had left to go to war (some still serving their apprenticeship) could not find work on their return and there was another exodus from the town, much smaller than the 1909 one, but still drastic. In memory of those who died on service the townspeople bought land at Drummurran Farm and formed a Memorial Park, with golf course, tennis courts and bowling green and erected a cenotaph on the hill above the tennis courts inscribed with all the names of the fallen. Twenty years later another generation of Maybole men were ready to go, as their fathers did, to again stop the mighty Germans when Hitler ran amok in 1939 and the old story of 1914-18 was repeated in the years 1939-45. The Maybole men fought on every front in all branches of the Forces and again some never returned to, see the sun rise over Kildoon. The memories of 1914-18 were still sharp and clear and the townsfolk were more sober in their attitude to the second World War and there was no display of enthusiasm as there had been when the Territorials entrained in August, 1914. For the first time in history a foreign foe could also attack the homes of the townsfolk from the air and this brought the harsh realities of war into every household. A Home Guard detachment was formed, Air Raid Wardens appointed, air raid shelters built, the Town Hall doors and windows sandbagged, guards placed on the water works and every possible defensive precaution brought into force. Children from large cities were boarded amongst the townspeople, detachments of the Inniskillens and Scots Guards were stationed for a time in the town and a prisoner of war camp was formed at Ballony and the stay at homes were as much the battle line as the soldiers who had gone abroad with their fighting units. For five years the old town survived a period of food and clothes rationing, blackouts, air raid warnings and other alarms until its men returned from the wars in 1945, as they had so often done in centuries past, sadly depleted in numbers and many never fit to walk round the Cross Roads again. A fund was raised by the townsfolk to send parcels to their fighting men during the war and a Welcome Home Fund was incorporated in April, 1944, to collect money to entertain the men on their return when peace was declared. 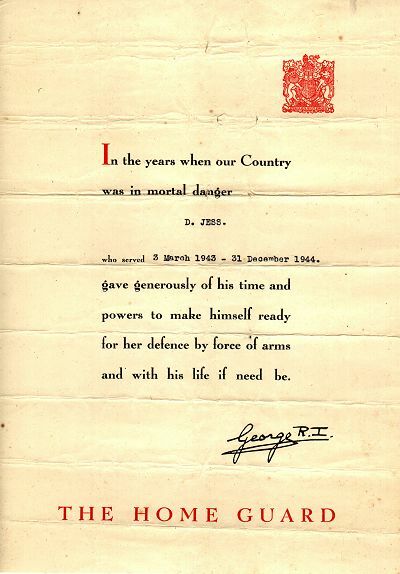 The sum uplifted amounted to £3,518 and this was distributed among the returning soldiers and the relatives of those who had been killed. Scrolls were prepared conveying the thanks of the people of Maybole for the services given to the nation by the serving men and women and each returning combatant was given a scroll with a gift of £4 in cash. In all 747 serving men and women received such scrolls and cash gifts while 29 war widows also received similar scrolls and gifts. The balance of the fund was expended in the purchase of the scrolls (£246) and other expenses and when the fund was cleared a balance of £66 was gifted to the town's Common Good Fund. The names of the 29 killed in action were inscribed on the cenotaph which had been erected in the Memorial Park after the 1914-18 war. It is indeed proof of the fighting spirit of the Minniebolers when it is realized that nearly 800 men and women joined the Forces in the last war from a small town with a population of around five thousand. It is to be hoped that this spirit will not be called upon again for very many years, as surely the townsfolk deserve to rest on their laurels after hundreds of years of answering the call to arms, but no doubt should it again be necessary the men of Carrick will, as ever, be ready.